oooh that trapeze dress is fun! it would probably be too short on me, womp womp. i blame a lot of my purchases on Gina! in fact, 2 things I am wearing today are because of her. But she's awesome, so i forgive her :) happy NYE girl! Thank you for forgiving me!! LOL! You need to try those apps! And hopefully use my code so you get some extra money (me too heehee). Their sales are really tempting! The first outfit is my favorite! Everything just goes together so well, and that cardigan color is perfect for this time of the year! I need to get better with the apps. I use the Target Cartwheel one but even though I have ebates and Ibotta on my phone, I never use them! Have a great New Years! Thanks Heather! I love it when you put on an outfit and it just works. Best feeling :) I love cartwheel as well! Especially the ability to scan products..so useful. Thank you so much Kat! I was also looking for a dress like that and this one was perfect. Love the long sleeves and the fabric is SO soft! You definitely need to check it out! Such great clothes. Shopping spree?! Happy New Year to you too! I love your outfits! They look comfortable and cute! I am obsessed with Madewell and Ibotta. So lucky we don't have a good mall nearby.. My favorite purchase was a black Lole dress, it has a turtle neck, and it is a really soft material, like a sweatshirt. It is the perfect winter travel outfit with leggings! Oohhh I haven't heard of Lole before so I'll have to look that up! Sounds great! First, I have to say how much I love your creativity in blog content. Your favorites series is such a great idea! One of my goals next year is to improve my content. Thanks for inspiring me! Second, I really love all of these. I am so lagging when it comes to fashion! I think I need to start buying and wearing real, non-workout clothes! And I'll definitely check those reebok shoes out once my spending ban is over. They'd go with most of what I wear too. Have a great New Year's Eve! That is the best comment you could ever give me Jennifer! My main goal and priority for my blog is to share creative content and be a little different from what's out there. I'm so glad that comes across and makes me keep pushing in the future :) Happy New Years to you! i see why you chose those are your fave looks!! they're gorgeous. and that necklace--it's so different from anything i've seen. i love it!! Aw, shucks!! I am excited to get a mention for top fashion purchase enabler of the year! LOL! But you made great choices and I'm happy that you feel like you get plenty of use out of your purchases. It's so fun to get to see your outfits now and how you make each piece (even if it's something I own) work for your lifestyle and personal style! So glad I got to know you through blogging this year! ooh, I really love that first outfit! Happy New Year to you! I love that dress from Express! I buy a lot of things in multiple colors especially when they are on sale! 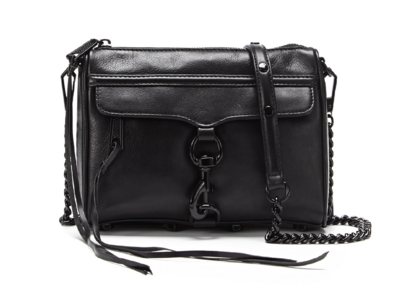 Rebecca Minkoff everything is so beautiful. I've always wanted one and got one for Christmas last year, but it was in a plum color because they got the order wrong and then when I tried to exchange, they didn't have the brown I wanted so I just returned it! Sad day. I love your style so much! Madewell is the best! Just wish it was cheaper hah! I would love to own a leather jacket :) it looks like it can be so versatile! It definitely is! Worth the investment for me! You're such an awesome dresser. Please come over and help me. Hahaha. Happy New Year, Gretchen! Thanks for all the Whole 30 recipes. I'm looking to start doing the Whole 30 as well. By the way, I'm also addicted to Express after this year, thanks to my boyfriend who introduced me to it lol.